I made you this Easy Homemade Salsa Recipe. My husband has a love of spicy foods. Me….not so much. He is addicted to chips and salsa and wanted to create a homemade salsa recipe. This salsa is great because you can whip it up in no time at all. Make it ahead the night before a big party to save yourself time. We filmed a shot video for this salsa recipe. You can view it below. For more videos, please subscribe to my You Tube channel. Say goodbye to store bought salsa. This recipe is all you need! In a food processor , chop 4 tomatoes until they are diced very small, but not totally pulverized. Pour the contents of the food processor in a bowl with the diced onion. Add the last tomato, cilantro, and jalapeno to the food processor and run the processor until the jalapeno has been chopped very fine. Empty the contents of the food processor to the bowl. Mince the garlic clove and add it to the bowl. Add the lime juice with the salt to the bowl and stir. Jalapenos are no joke if you don't like spicy food so be careful. To lessen the heat, don't add as much jalapeno or use another chile with less heat. You can also remove the seeds. That is where most of the heat is. This is also better the next day, so refrigerate overnight and let the flavors really settle in. Simple and delicious. Looks wonderful, Melissa! Melissa, I just wanted to wish you and your family a very Merry Christmas ! You always give so much to your followers ( I don't know how you do it) your recipes are alway amazing and I just wanted to tell you how much I look forward to seeing what new one you will post! Thank you and a very Happy Healthy New Year! Thank you so much Kathy! Merry Christmas to you as well! I have been on a chips and salsa kick lately, and after finishing a jar of store bought salsa and looking at the ingredients list, I knew that homemade was going to be my only route from now on. Well I hope you enjoy this recipe! Ideas for variation: Less heat- use Anaheim chili instead of jalapeno. Way less heat- use 1 green bell & 1 red bell pepper. Now for the fun- Roast everything first. Char the peppers & tomatoes under the broiler until skin is bubbly and dark, then place in plastic bag. Give them about 5 minutes to "sweat" , remove seeds and peel off darkened skin. Proceed with original recipe above. Great ideas! I have a recipe for guacamole where we roast tomatillos and chipotle peppers first. Really adds a great level of flavor. Thanks Shelley! I hope you enjoy the recipe! I wish I could credit the blog, but I remember a post from someone entitled "mexican vs mexican't". It stated that the secret to proper salsa al fresco is to add a pinch of cinnamon. I make many versions of fresh salsa based on whatever is in the fridge, but I always add the pinch of cinnamon! That is interesting! I haven't heard that, but I will try it next time. Does 2T stand for tablespoons or teaspoons? 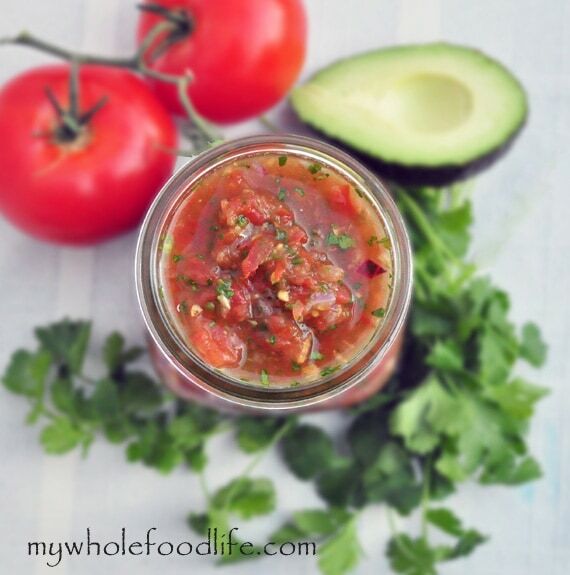 I'm going to have to try this...I simply adore salsa! Quick question, what to do in the off season when yummy vine ripened tomatoes aren't growing in my garden? Do you think organic whole canned tomatoes would be a decent substitute? I think that might work as well. I hope you enjoy the recipe! Thanks Ashley! I stumbled your amazing lemon cookies yesterday. Yum! I always added avocado to it! Do you know if there is a way to 'can' or freeze this to use later in the year, past the fresh produce months? I freeze it, but I haven't tried canning it. This recipe is so easy and absolutely delicious! Hubby and I always inhale the whole recipe immediately, no leftovers!